PowerBar®, the company that pioneered the energy bar category more than 30 years ago, is changing the game once again and announcing its yearlong Clean Start Pledge designed to inspire and motivate everyone to move forward from the past and better themselves in 2017. According to a recent PowerBar survey on commitment and goal-setting, two-thirds of Americans say they’re in need of a clean start and are determined to make 2017 a productive year after 2016 didn’t play out as hoped. PowerBar is helping to jumpstart their efforts with the brand’s new Clean Whey Bars which offer nutrient dense, ingredient rich energy with 20g of high quality protein and no artificial flavors, colors or sweeteners. As part of the Clean Start movement, PowerBar is giving away more than 500,000 Clean Whey Protein Bars to provide the energy needed for consumers to begin their Clean Start this year. To kick off the campaign, PowerBar will feature Olympic gold medalist Ryan Lochte in the Clean Start digital advertising creative. The 60-second anthem video can be viewed on the new microsite, PowerBarCleanStart.com, and also on media in 30- and 15-second versions. In the spot, Lochte reflects on his journey and desire to wipe away the past and start clean in 2017. 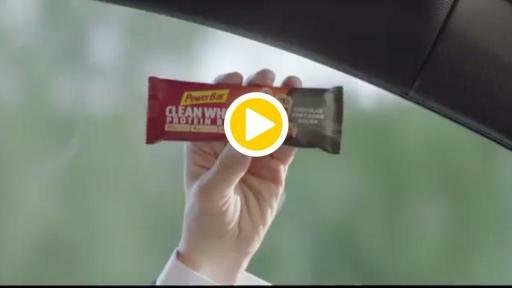 The PowerBar Clean Start Pledge is the first 360° campaign from the brand in more than 10 years and will span multiple touchpoints including digital, social, public relations, sports marketing, consumer promotions and influencer outreach. The majority of goals and targets for the New Year will drop by mid-January, with the average resolution failing within 15 days, according to survey results. Over half of the survey respondents said fitness and diet goals are the most difficult goals to keep. The PowerBar Clean Start Pledge kicks off on January 18th, the day after “Ditch Your New Year’s Resolutions Day.” The pledge is a commitment to move forward and not dwell on the past. Whether promising to take a walk each morning, play basketball weekly or train for a half marathon with friends, the Clean Start Pledge should encourage all consumers to use the joy of sport as a vehicle for a new beginning. The campaign kicks off with a homepage takeover on Bleacher Report, featuring the new Lochte video, plus targeted pre-roll on Mashable, ESPN, Hulu, Youtube, Buzzfeed, and a video buy in the MyFitnessPal app. The videos will also drive to PowerBarCleanStart.com where consumers can take the pledge, get inspired by others’ pledges and stories, and receive a free Clean Whey Protein Bar to provide a little energy to help them take their first steps. Fans visiting PowerBarCleanStart.com will also have the opportunity to create their own personalized Lochte Clean Start video message using AdGreetz technology to share via social channels. After kicking of the Clean Start Pledge with Lochte, social influencers, including all 100 members of Team PowerBar, will also share their Clean Start stories on social media and document their progress throughout the year. To take the Clean Start Pledge visit PowerBarCleanStart.com. For more information on PowerBar products, visit PowerBar.com or connect with us on Facebook at Facebook.com/powerbar, or on Instagram and Twitter by following @powerbar. Thirty years ago, PowerBar was developed to help athletes from all walks of life recharge and refocus. We have continued to evolve our portfolio to include a wide selection of Protein, Endurance Nutrition, Energy and Wholesome Snacking products crafted from high quality ingredients to meet the needs of all athletes. From sunrise sessions to sunset bike rides, from celebrating the team victory to rallying after defeat, we’re here to help you savor every moment, both on and off the field. It’s about the commitment to the team, the love of the game, the effort you leave on the field and the joy you carry off. For more information about PowerBar, visit PowerBar.com. ,  This survey of 2,000 US adults was conducted between December 19, 2016 and December 29, 2016 by Market Researchers OnePoll and commissioned by Powerbar. For the complete survey results, please contact Maeghan Scott, Hunter PR.